as built: flight deck for 2 SH-2 Seasprite LAMPS-I helicopters / below-deck hangar for 1 helicopter. after refit: flight deck occupied by Tomahawk missile storage and launcher. The Virginia-class nuclear guided-missile cruisers (CGN-38 class) were a series of four double-ended (with armament carried both fore and aft) guided-missile cruisers commissioned in the late 1970s, which served in the US Navy until the mid- to late-1990s. With their nuclear power plants and the resulting capability of steaming at high speeds for long periods of time, these were excellent escorts for the fast nuclear-powered aircraft carriers, such as the Nimitz class. Their main mission was as air-defense ships, though they did have capabilities as anti-submarine (ASW) ships, surface-to-surface warfare (SSW) ships, and in gun and missile bombardment of shore targets. The ships were derived from the earlier California class nuclear cruiser (CGN-36 class). They were decommissioned as part of the early 1990s "peace dividend" after the Cold War ended. A fifth warship, the CGN-42, was canceled before being named or laid down. It was found that while it was possible to mass-produce nuclear-powered warships, the ships were less cost-efficient than conventionally-powered warships, and the new gas-turbine-powered ships then entering the fleet (the Spruance class destroyers) required much less manpower. Following the end of production of this class, the U.S. Navy continued conventional destroyer/cruiser production, and it redesignated the DDG-47 class of Aegis guided missile destroyers as the CG-47 Ticonderoga class cruisers. Three of the four Virginia-class ships were authorized as guided missile frigates (in the pre-1975 definition), and they were redesignated as cruisers either before commissioning or before their launching. The last warship, the USS Arkansas, was authorized, laid down, launched, and commissioned as a guided-missile cruiser. The early retirement of the Virginia class (CGN 38-41) cruisers has been widely criticized. They were new, modern ships; given a New Threat Upgrade electronics overhaul they would have been well-suited to modern threats. They had rapid-fire Mk 26 launchers which could fire the powerful Standard SM-2MR medium-range surface-to-air missile. Earlier decommissioned cruisers used the slower-firing Mk-10 launchers which required manual fitting of the fins of the missiles prior to launch. Nevertheless, the CGN-38-class cruisers, with their missile magazines and Mk-26 missile launchers, were incapable of carrying the SM-2ER long-range surface-to-air missile, being restricted to the SM-2MR medium-range surface-to-air missile. This was a significant limitation in their capabilities. Another weakness was a lack of LAMPS helicopters, which had been replaced by the Tomahawk cruise missile. In the end, what really doomed the ships was economics. They were coming due for their first nuclear refuelings, mid-life overhauls, and NTU refittings, all expensive projects, together costing about half the price of a new ship. Further, they required relatively large crews, straining USN personnel resources. 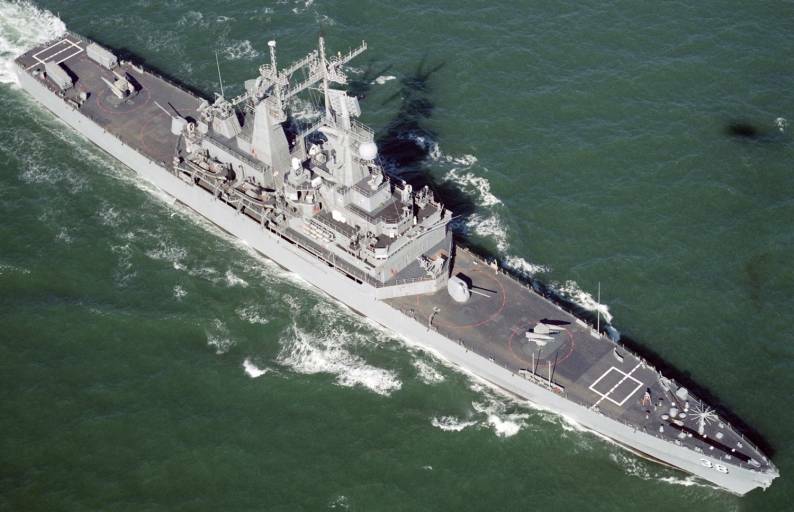 The 1996 Navy Visibility and Management of Operating and Support Costs (VAMOSC) study determined the annual operating cost of a Virginia class cruiser at $40 million, compared to $28 million for a Ticonderoga class cruiser, or $20 million for an Arleigh Burke class destroyer. Given a lower requirement for cruisers, it was decided to retire these nuclear ships as a money-saving measure. The early non-VLS Ticonderoga class cruisers had equally short careers, serving between 18 and 21 years.